Over the last few years, the State of Amazonas has developed an original forest policy 1 based on small-scale sustainable management of forests, the creation of protected areas and a climate law. Below we discuss the possible evolutionary scenarios for the Amazonian forests at the state level and the challenges that the policy needs to address in the light of reference studies. Nearly all studies are agreed that deforestation is not primarily the result of the exploitation of forests and that the sustainable management of exploitation is one of the best ways of maintaining forest cover in the long run. Agricultural colonisation and the creation of extensive pasture land for animal breeding, on the other hand, are directly responsible for the destruction of forests. The opening of land communication routes has an extremely significant impact on deforestation. The models and simulations that have been created (see above for a discussion), take this into account. A close relationship between modes of forest exploitation, animal breeding and agriculture exist. Agricultural fronts made of Soya plantations, for example, are usually created on land that has been deforested and converted into pasture land. These pastures are usually created after a phase of haphazard and non-sustainable exploitation of land by foresters for crops with higher commercial value, which opens up the way to and leaves behind them depleted and more accessible forest land. These can be more easily appropriated by peasant families, and then sooner or some years later, by large-scale stockbreeders. 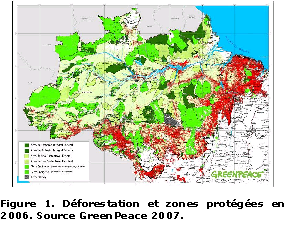 The map below, created by GreenPeace, shows the main agricultural fronts (in red) for the whole Amazon area. The State of Amazonas is marginally affected, where it adjoins the States of Matto Grosso, Para and Acre and the area around the Amazon near Manaus. One of the key elements of both the State and Union Government’s strategy has been to create zones where special laws on access to natural resources apply in order to slow down the process of deforestation. These zones termed “protected” will rely on the Union or the State. They would have a different status: Indian reserves will not be managed in the same way as Conservation Units. Based on the model created by Soarez Filho et al., the map below (Figure 2) gives us an idea of what the Amazonian rain forests will be like in the year 2050 unless significant policy changes are made. 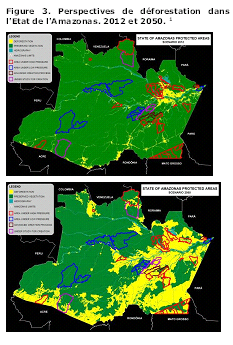 The maps below 2 show the growing encroachment of deforested land in the years 2012 and 2050 and assess pressures on protected areas administered by the State of Amazonas. Although there are some protected areas (in blue) that are not under pressure, there are others (in red) for which the most likely scenario, according to these simulations, is the disappearance of forest cover in the next few decades. The forest policy of the State of Amazonas, based on promoting small-scale forest management, is original and one of its kind in Brazil. But will it be able to counter the current predominant trends? The State of Amazonas is vast and diverse. The pressure exerted on forest land differs from area to area, as is evident from cartographic documents created at the time of macro-zoning. For example, in Alto Solimoes, the border area Amazonas shares with Peru and Colombia, the demand on resources is weak. In Boa Vista do Ramos – Maues to the east of Manaus, where it is easier to get to by the river Amazon and where there is greater demand from the North and the East of the State of Para, forest clearing is important. In the southern part of the state (the Apui region), there is considerable agricultural colonisation that developed with the opening of Route BR 230 (constructed in 1932) and route AM 174 (constructed 20 years later), and the proximity of the states of Para, Matto Grosso and Rondonia, where deforestation is very active. Deforestation in this area continues to increase. Here may be found asentamentos managed by INCRA (Instituto Nacional de Colonização e Reforma Agrária or the Brazilian National Institute for Agricultural Colonisation and Reform) along with forest land managed by IBAMA (Instituto Brasileiro do Meio Ambiente e dos Recursos Naturaisor the Brazilian Institute of Environment and Renewable Natural Resources) or by IPAAM (Instituto de Proteção Ambiental do Estado do Amazonas or the Brazilian institute for the environmental protection for the State of Amazonas). Millions of land tracts were distributed by INCRA to migrants who initially came from the south (Parana), and then from Rondonia and Matto Grosso. The economic logic followed is primarily the promotion of extensive animal breeding. 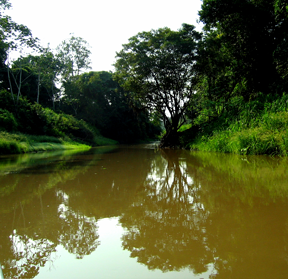 Illegal forest exploitation is rampant3 and the unlawful acquisition of land (grilagem) is frequent, especially in areas along the border with Para that have been declared State Conservation Units. The processes of asset appropriation and rent capture appear at work constantly and in a similar fashion throughout these regions, although they may be practiced with greater or lesser intensity and modalities may vary considerably from region to region. Let us discuss some of the basic concepts of rent as developed by classical economists 4. The same quantity of labour and capital used to work different plots of land do not necessarily produce the same quantity of goods. The difference, that is the rent, cannot therefore be ascribed to the producer and may be taken by the landowner. Even if it is simplistic to restrict the analysis to its economic dimension without taking into account the differences in the various types of rent, this concept highlights the acquisition of control over land and its inherent natural resources and access to income not directly related to work done on or to the capital invested in the said land. Rent is never generated purely from natural resources, as it is linked to the market system and the high prices of certain products. As this market is accessible, it is possible to gainfully work certain land parcels and this enables the owner of the land in question to generate an income. New forms of rent could come into existence when new products are introduced into the market. 1/ Loggers who exploit precious wood oils are able to capture a rent, but this rent is effective only if they have access to resources and if it is economically viable to continue such exploitation. According to their economic logic they should be able to realise a profit that is equal or greater than what they would obtain by investing in other activities (capitalist farmers) or they will simply try to maximise the income generated (small family foresters). For them to be able to do that, they should have the right to cut and extract or resell logs, failing which they should have the means to work the plantation clandestinely and/or illegally or in a non legitimised manner. They should be able to benefit from existing routes of communication that will enable them to reduce extraction costs, markets where they can sell their produce and the presence of cheap labour if they follow the managerial model or outsource their work to small lumberjacks. A key issue therefore is the reproduction of forest resources and this is the main challenge for the various sustainable forestry policies. In reality, the costs of forest maintenance and the reconstruction of forest resources are seldom really taken into account in economic assessments and the part of income that is assimilated to a rent becomes predominant. This is therefore not only a case of differential rent as defined by Ricardo, but akin to “mining” exploitation. Once the resources are exhausted, one has to either change one’s activity in order to be able to use the same plot of land or migrate to other ‘virgin’ lands to continue to exploit precious wood reserves that have not been exploited in the same way yet. 2/ This problem arises in all gathering, fishing and hunting activities. Extractivism is a common feature of rent generated by rubber as well as Brazil nut (castanha)… The same problems of sustainability arise in case of fishing, nuts or rubber. The creation of extractivist reserves are intended to ensure that inhabitants exploiting natural resources are also owners or managers of the land, enjoying long-term security in order to guarantee sustainable management. 3/ Farmers and animal breeders who clear the forests for small-scale food-producing cultivations, large-scale commercial plantations (soyabean, African palm, etc) or practice extensive animal breeding enjoy a rent inherited from forests. 4/ If policies promoting environmental services are implemented and it becomes possible to sell carbon credits by replanting trees under the Mechanisms of Clean Development Programme (carbon wells) or obtain resources by avoiding deforestation (REDD 5), the acquisition of forests that are still standing (but are sufficiently under threat to render credible the fight against their destruction) will be a source of a new type of rent. In general, such rent may be acquired through the free or near free acquisition of land and its resources. Once land and its resources enter the market system, their price corresponds to the valuation of land rent. According to the amount of capital invested in financial and economic circuits, it may or may not be profitable to buy the land. Whatever the land acquisition pioneer front and the privatization of land and common resources process, it always begins with “primitive acquisition”. Even at this stage, various social groups and separate interests may oppose each other on the issue of rent capture. Some groups are local, comprising native inhabitants of the region, indigenous peoples or caboclos, others may be State-level authorities or even higher levels involving other Brazilian states, the Federation (União) or even authorities from beyond the nation’s borders. Small-scale management plots are not free from the aim of capturing rents. Persons having applied for and obtained small-scale forest management plots include forest technicians from inland localities who have never been lumberjacks or forest entrepreneurs themselves and who are simply looking to profit from the situation. Some businessmen use pseudonyms to acquire control over several forest management plots measuring less than 500 ha at different sites. Such practices although not authorised by current regulations and norms, do not appear to raise any objections and is common knowledge. The relations of force that exist between these opposing groups determine the leeway of the State of Amazonas. The State has created an alliance with inland populations to form a sustainable development plan that enables the implementation of mechanisms for the use and protection of forest resources; in the last few years, it has tried to create similar alliances involving international actors on the issue of carbon credit capture. Compensation mechanisms for avoided deforestation create a new source of rent that is more artificial and less directly related to material produced from the land, but whose total sum may well be significant. Although the struggle for the appropriation of this new type of rent is not made explicit as yet, it is nevertheless very real. Land tenure: what is at stake? It is therefore easy to understand the increasing importance of land tenure policies when analysing the viability of forest management policies. Land tenure policies generally originate in processes defined at the highest level and is related to the State constitution. They may even have their source at the Federal level, in which case it is related to the national Union constitution. The incoherence and contradictions that are realised on a day-to-day basis at the ground level are often regretted, without going so far as to question the law itself, and even less the fundamental law of Brazil. In a recent World Bank report 6, Malcolm Childress confirms that claims from private actors for greater control of large tracts of land are becoming more aggressive and accelerated. These private entrepreneurs identify land of interest, do the necessary paperwork, and appropriate the land using law that lacks coherence and presents huge legal loopholes. This race to land acquisition begins generally with the legalization of precarious land occupation and the use of fraudulent documents. Public institutions are trying to control this process by implementing zoning, creating protected areas, allocating forest concessions in public forests and by creating sustainable development projects. 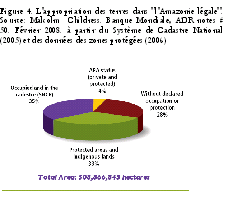 According to Childress, up to 50% of the property or possession deeds in the Legal Amazonia are suspected to be illegal. The estimate in land with existing rights of possession (posse) vary according to one’s source of information. Severe violence is also a consequence of this situation. As mentioned earlier, the situation in the State of Amazonas differs considerably from this overview, but future changes are headed in the same direction. The graph allows us to estimate the amount of land that is in the process of being appropriated in Brazilian Amazonia as a whole. Land register data were established on the basis of declarations from those using the land. Approximately 35% of 509 million ha in the region are under private possession or are private property; protected or indigenous areas comprise 37%, while 28% of the land is neither protected nor appropriated. Nevertheless, as Childress points out, the situation is more complex since a part of the protected areas is already under private possession and that an unknown percentage of land officially believed to be non-appropriated has been claimed by private and public actors. The main issue at stake in the region is the capture of land income, and to a great extent, this is possible by private acquisition of land. 1 See the article “BRASIL. Forest and climate policies in the state of Amazonas. Michel Merlet (AGTER). 2009, May. 2 Source : paper from the Sustainable Development Secretariat (SDS) of the State of Amazonas.